Plant-based intensive balm, with natural beeswax to protect against the elements, and sweet almond oil to soothe and deeply nourish dry lips. Fragrance free for extra sensitivity. This is a good lip balm which keeps your lips hydrated throughout the day. This one is minty which isn't my favourite, I much prefer the beeswax balm but that is just a personal preference. Though I'm sure some of you would prefer the peppermint. When it comes to skincare (and lip care) I like to go for natural based options, so I decided to give this one a whirl. The packaging is plain ordinary lip balm packaging, but as the whole in the center came through it did a weird squirty thing I've never come across before. In terms of how it feels on the lips, it is nourishing, refreshing and lasts a standard amount of time. I've only been able to find the peppermint lip balm but it smells lovely so I'd probably stick to that over fragrance free personally. I would purchase it again. Amazing lip balm but horrible packaging. I was gifted this lip balm for my birthday. I am a lip balm hoarder but had never tried this one before. It comes in simple packaging which looks modern. I quite like it. I got the peppermint one, I am not a huge peppermint fan but I found it quite nice. I love that it is plant based and literally has only a few ingrediants and no nasties! It does a good job at keeping my lips hydrated and feeling smooth. Will be interesting to see how well it does during the winter months when my lips get super dry. I wouldn't say it is better than my blistex lip conditioning balm but it is very close. I would probably buy the fragrance free if I was to purchase it for myself. All in all a great lip balm. I'm a fan of this lip balm because it's hydrating and is a standard price. My sister swears by it because she's trying to go vegan, so sees it as a god-send. I'm not too worried about the fact that it is vegan, but it makes me happy to know what I'm putting on my lips. Currently I've got a different natural lip balm, but once I lose or use all of it I'm tempted to get another eco store one. The peppermint is a very nice flavour. I received the unfragranced lip balm last year from my Secret Santa as a little side goodie to my main gift. The thing that stands out about this lipbalm is that it only has three ingredients. Three natural ingredients - sweet almond oil, beeswax and cetearyl alcohol, a plant based conditioning agent. I didn't have super high expectations for this lipbalm. Because I'm not a huge lipbalm collector I stick to certain brands and can afford to, since I actually finish a whole tube. This lipbalm does a decent job of moisturizing my lips and keeping them conditioned, it does the job much better than chapstick. However, since it's the same price as my favorite Hurraw lipbalms and I get the same amount of product as the Hurraw ones I don't think I'll repurchase this. Tips: I would recommend this to those who are allergic or sensitive to essential oils and just want a simple plain balm. Probably a good lipbalm for kids, unless you're allergic to almonds. This lip balm was gifted to me by a co-worker and I love it! I had not seen it in stores at the time she gave it to me, so it was a nice surprise to try it out. 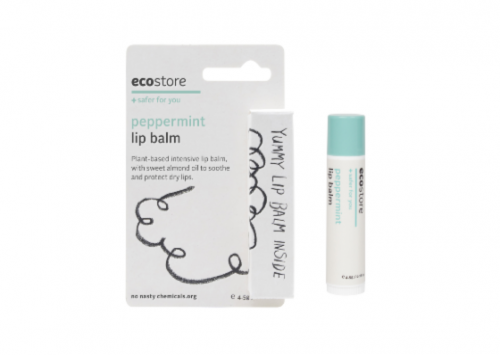 I love the cool, fresh feeling of the mint, and it actually keeps my lips hydrated and smooth. It helps when they are chapped and cracked, it feels like a medicated balm. Tips: Treat yourself before going to bed, give them a light exfoliation with a mix of sugar and oil (or a Lush lip scrub :D) and then load up with the lip balm. This is a great lip balm! I love that it is natural and cruelty free. It keeps my lips moisturised for hours! This is one thing I cannot go a day without as my lips feel horrible if I don't have lip balm on but I've found that this product keeps my lips hydrated the longest (I have tried plenty of others!). I'm not a huge fan of the pepperminty slight tingling sensation but have gotten used to it, it's definitely nowhere near as bad as the Blistex one, I can't stand that! I will try the Beeswax one next as I feel I would like that one better, but am definitely happy with the Peppermint flavour. I got this lip balm free to sample (I think from countdown online delivery) and was hopeful that it would be a balm that I would like. Often I find lip balms to be too waxy and sticky which was not the case for this one, it goes on smooth and leaves a comfortable moisturizing layer on your lips which feels really nice. I like the packaging which is consistent with the Ecostore brand. The smell isn't overwhelming which is also a bonus for me as I find it strange putting strong smelling products on my lips! This is a great lip balm especially when you get the horrible dry winter lips. Tips: Have used before on my cuticles for a quick nail treatment.